You can install up to four Cyclades PC300 PCI Adapters in one PC box, if you have so many adapter slots and IRQs available. The Cyclades PC300/RSV Synchronous PCI Adapter comes with a V.35 cable. This cable should work for all standard modems, which have V.35 connections. For synchronous modems, which have a DB-25 connection, you should use a standard DB-25 cable. 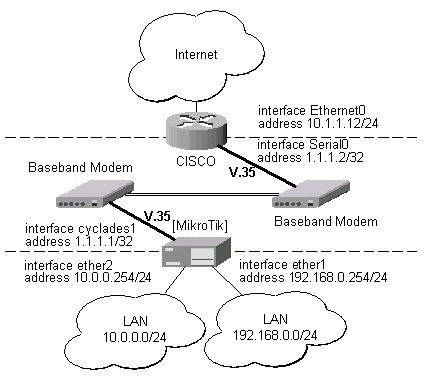 Connect a communication device, e.g., a baseband modem, to the V.35 port and turn it on. The MikroTik driver for the Cyclades Synchronous PCI Adapter allows you to unplug the V.35 cable from one modem and plug it into another modem with a different clock speed, and you do not need to restart the interface or router.